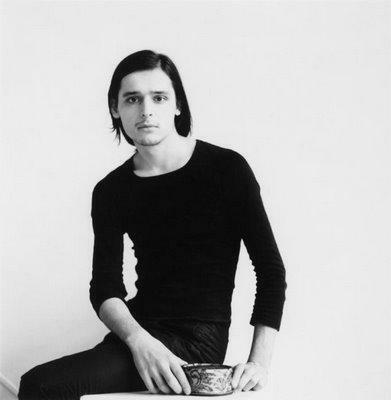 Olivier Theyskens was borne don January the 4th of 1977, in Brussels, Belgium. Son of a chemical engineer and a homemaker, he dreamed, when he was a child, to be a girl and be able to wear skirts and look like a princess. So it wasn’t surprising when, at the age of 7, he claimed that he wanted to do Haute Couture. In October 1995, at the age of 18, he finally got to starts the studies of fashion design at the École Nationale Superieure des Arts Visuels de la Cambre, but within a year he felt that he was losing time so he dropped out to start his own label. He was only 19 years old. His first collections were defined as gothic extravaganzas and were made out of bed sheets his grandmother had given him. He created an amount of 25 designs which were shown at a showroom in Paris. There, one of Barneys stylists saw the collection and fell in love with it, wanting to buy it all, which Theyskens refused. Even so, the collection was shown at Barney’s shop windows during a few weeks, where Madonna saw them and fell in love with the creations. She finally wore one of his dresses in 1998 to the Academy awards, and since then, the name of Olivier Theyskens has been known by all the fashion industry. He finally had to close his label because he didn’t have enough money to create it. So he started working as a costume designer at the Théâtre de la Monnaie even though he never stopped creating dresses as a pastime. In 2002, the French brand Rochas, well known for its perfumes and not so much for its fashion lines, selected Olivier as the new creative director. His first collection, presented in 2003, was amazingly claimed by the critics and, since then, he created a completely new silhouette for the brand, very elegant and French influenced. In 2006, Theyskens was rewarded by the Council of Fashion Designers of America with the International award. However, Theyskens designs, really magical, special and fantastic-world-belonging, didn’t really fit within the ready-to-wear market and either within the idea of Haute Couture and its rules, so it wasn’t being really profitable for the brand. The designer’s refusal to create a marketable accessories line and the fact that he didn’t give importance to advertising ended up with Rochas’ demise. In 2007 he was named artistic director at Nina Ricci, where he presented a more commercial line. After presenting three collections in the house, his contract, which was expiring on 2009, was never renewed and his position was taken by Peter Copping, from Louis Vuitton. Nowadays, Andrew Rosen, Theory’s CEO, has hired Theyskens to design a capsule collection that has already been presented and that will be sold this summer. Theysken’s style is a perfect mix of old, gothic and romantic time’s nostalgia with the actual figure of the modern woman, very strong and active, and, overall, really feminine.